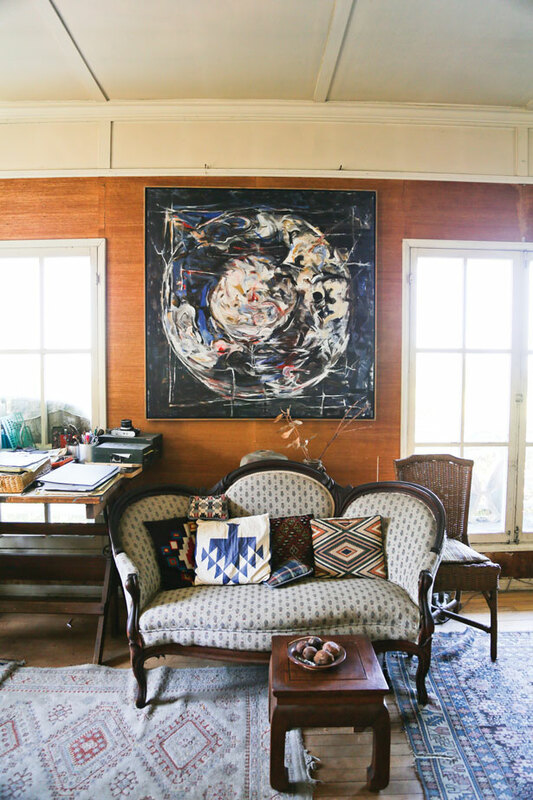 Working artists living in cozy hillside cottages with a view of the ocean have become the stuff of Laguna Beach’s art colony legend. 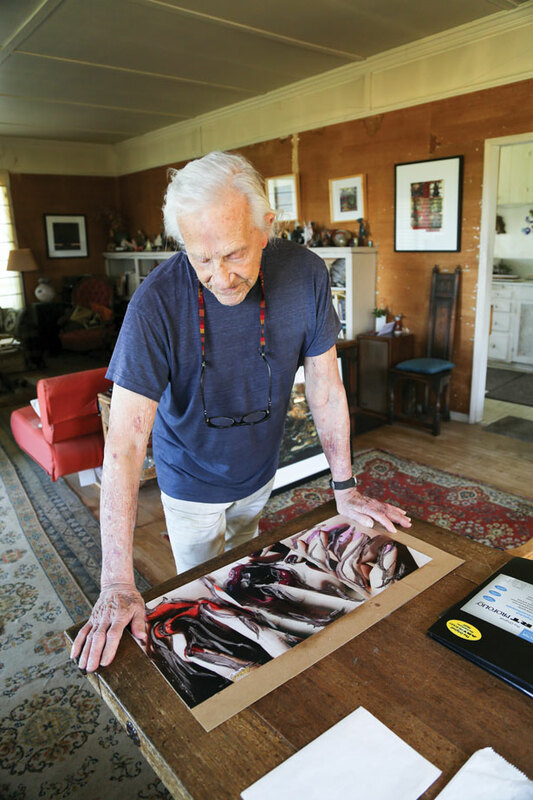 Paul Darrow, honored by the Community Art Project (CAP) with a Lifetime Achievement Award at this year’s Art Stars awards ceremony, lives and works in such a cottage, located on Cuprien Way, a scenic street named after the stellar land and seascape painter. This seminal group, including Phil Dike, Andy Wing, Rex Brand, Leonard Kaplan and Roger Kuntz, among others, brought Modernist sensibilities to a community steeped in plein air painting or stylistic variations of California Impressionism. 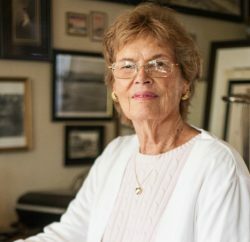 “We see Paul as unique, a part of the last half century of the Laguna Beach art community,” says Wayne’s wife Faye, chair of the Community Art Project (CAP). Still prolific, Paul keeps framers busy, and his home and studio are filled with evidence of a lifetime of creative exploration. 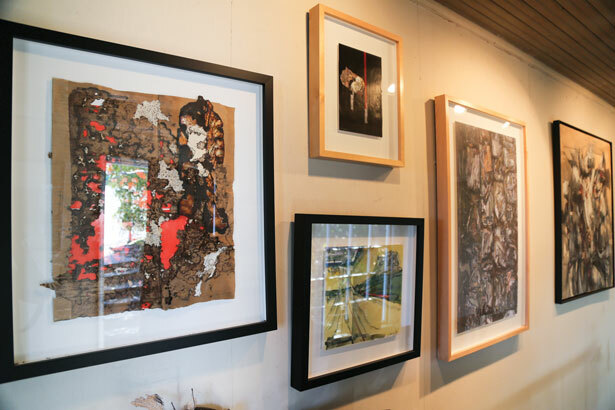 Entering the foyer, visitors will find Paul’s latest collages casually leaning against the banister. 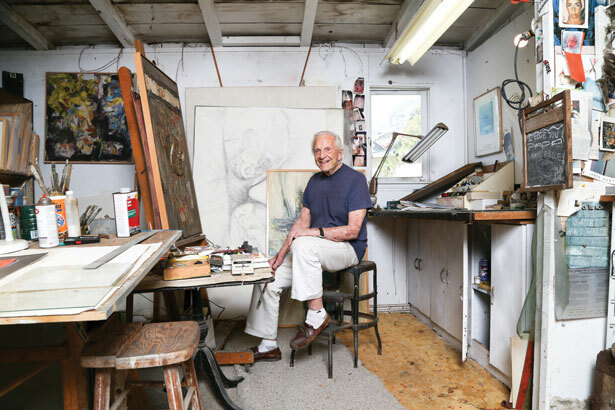 Downstairs, racks of abstract paintings attest to his love of nature, especially the ocean and the boats that ply its waters. John Marin comes to mind while studying some depictions of sailing regattas. “I’ve always had boats; I can’t seem to get away from them, no matter how abstract and subliminally they surface,” Paul says. Keeping the vicissitudes of age at arm’s length, Paul has the weathered looks of the sailor he has been all of his adult life, until recently when difficulties in keeping balanced footing finally kept him off the Gleam, his cherished 30-foot sailboat that he still keeps at the Balboa Yacht Club. A grandfather of six, he notes that some of the latest generation follows the family path. Save for his balancing difficulties, he appears fit and stays busy by working at novel forms of self-expression. 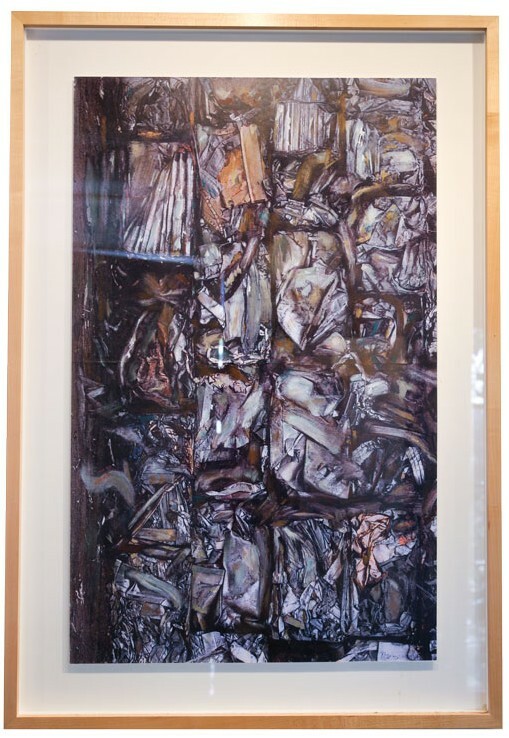 A worktable in his living room is covered with magazine cutouts, pictures and select images ready to be turned into collages, which he alters with a dry-marking pen that he has deployed into a pigment reduction tool. Used on the kind of whiteboard it was intended for, the pen will disgorge color. Anywhere else, its inherent chemicals have the opposite effect, lifting the pigment off magazine photographs, for example. Outlining images or drawing through them, Paul uses this effect to create abstract images that only vaguely, if at all, recall the original. However, that’s only the start. Once Paul has affixed shapes of paper or cardboard, or whatever materials he happens to select, onto paper, he relays the results to photographer James Nordstrom, whose use of digital technology turns the works into abstracts that are an example of how “traditional” art can seamlessly adapt into computer technology. Paul has painted conventional landscapes as well. After having undergone similar digital processes to his other works, they are turned into visually engaging compositions. James emphasizes that, regardless of his technological assist, the works are pure Darrow originals, and he does not take any credit for artistic results. “I am not a collaborator or co-artist, I am a photographer; I do my own artwork,” he says. It’s a shift for an artist whose previous body of work has been organic to say the least. Paul describes himself as a pack rat, someone unable to throw anything away. His studio evidences a level of recycling that puts the most hyper-fanatic environmentalists to shame. Here, one can find anything ranging from rusting pipes to sacks of discards that, at one time, included cast-off shoes from Central America, an old turtleback and every conceivable sort of paper. Just about anything imaginable stands a chance of being reincarnated as part of a work of art. This mode of creativity came to fruition when his house sustained major damage from a water leak and he lost, among other treasures, his extensive book and record collections. He turned adversity into art by repurposing disintegrating book and record covers, rusty pipes, metal objects and flotsam others would have consigned to the dump, into collages that gained him shows at museums and galleries and a roster of collectors including banks, corporations and private individuals. 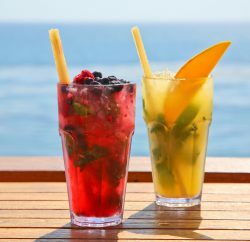 Notably, he counts the great furniture maker Sam Maloof, the Orange County Museum of Art (formerly the Newport Harbor Art Museum), Air France, several banks, the Balboa Yacht Club and even the Navy among them. 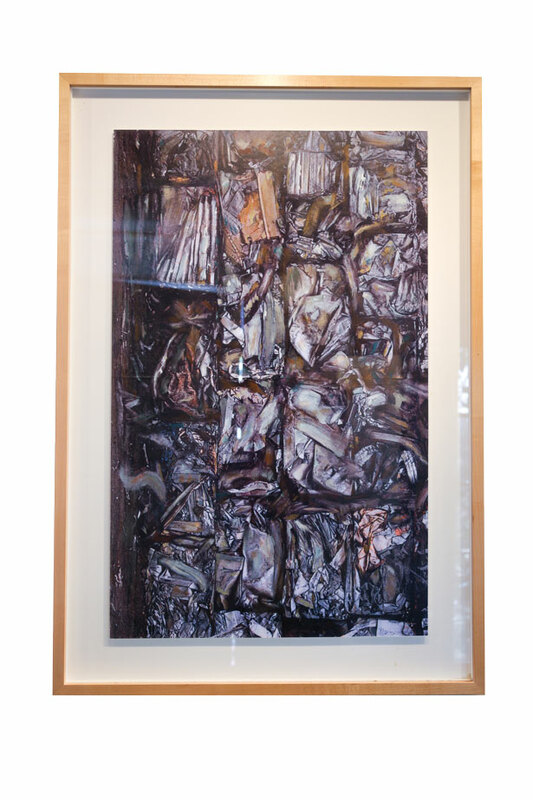 Whether he paints landscapes and abstracts or sketches nudes or assembles collages, Paul’s art is infused with spirituality. Mandala-shaped or free-form collages often contain vestiges of Tibetan script and images of Buddhist saints or Hindu deities. A practitioner of yoga and student of Asian religions, he uses his art as a spiritual outlet and a way of communicating with his fellow humans. 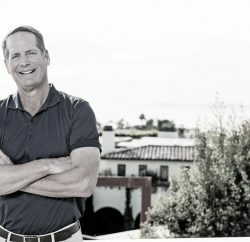 Gallerist Peter Blake, who stopped showing Paul’s work after moving to a larger space and specializing in minimalist art, lauds him as the finest artist in Laguna Beach. “What Paul pulls off from what others might throw away is not just beautiful but soulful. He defined ‘sustainable’ before the word was even formed,” Peter says. A few years ago, when confined to the hospital after brain surgery, Paul began to draw as soon as he regained enough strength. “I asked the nurses for a pen and paper, and later friends brought me art supplies,” he recalls. Making art aided his recovery, which included re-learning how to walk and talk, and it was during this personal trial that he conceived his signature mandala-shaped forms. Journalist training and an innate ascorbic wit propelled Paul’s avocation as a political and satirical cartoonist. He has written several articles and also illustrated books (in a New Yorker style) such as “The Academic Bestiary,” a friendly send-up of college professors’ egos, written by Richard Armour. And yes, the man also made music. Proficient on both the saxophone and clarinet, he appreciates modern jazz but leaned, while playing, toward Dixieland. I was a young (15) summer student of Paul Darrow in the 1950’s. I came to Laguna in 1964 and dug water wells in Laguna Canyon on what was a small ranch house. I moved to town closer to the beach in 1971 and now live near Pauls home and studio. Mark Chamberlain of BC Space Gallery Laguna Beach and Richard White and I curated his retrospective ; he also had another through Laguna’s Community Arts Project. He’s still the delightful rascallion, creating and mailing cartoons; his wonderfully inventive ideas and impressive body of work spans generations infused with printed and dimensional items informing his mixed media “paintings-” many are sculptural.. I do not think Laguna School of Art (LCAD)morphed out of Otis Art Institute; it was my my undergrad art school then on Wilshire near Alvarado across from MacArthur Park. Formerly it was called the LA County Art Institute headed by Millard Sheets, then Jarvis Barlow… and so on; Otis College of Art and Design is now located at 9045 Lincoln Blvd, Los Angeles, California. There is an online timeline and history but LCAD is not part of its history.